Welcome to our new living room! 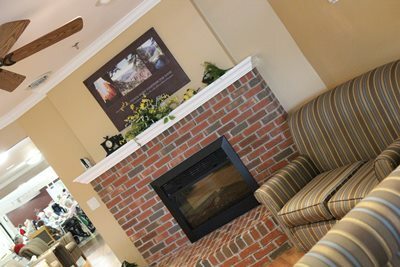 It is truly our 'home' now, and we invite you to come visit us! For many years, the main living room of Fairview Haven was dominated by the central nurses' station. The hustle and bustle of the nurses working, phones ringing and beepers beeping created excess chaos and stress in the living room. As the first sight to greet every visitor who walked in the front door, the nurses' station spelled institution and healthcare, rather than Home. ﻿In the winter of 2009-10, our construction crew began dismantling the central nurses' station and creating a new living space. After several months of hard work, our dream came true with a beautiful, comfortable and quieter living room, as well as a conveniently-located nurses' office. Privacy of health information is also greatly improved as phone calls by the nurses can no longer be easily overheard.